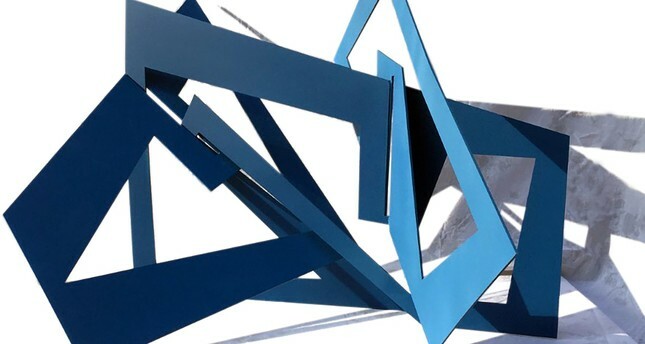 Nermin Ülker uses metal, mostly stainless steel and weathering steel in her works. KRANK Art Gallery is hosting renowned sculptor Nermin Ülker's third solo exhibition entitled "Hane" ("House") at its art space at Le Meridien Istanbul Etiler. Ülker, who was raised in an environment where the concept of the house was seen as a shelter protecting one from the dangers of the exterior world and becomes taboo as the symbol of the communal order, tradition, security and harmony, gives a binary character to the concept of the house in the exhibition and describes it as a place of overlaps, apart from being a shelter. In her works, the concepts of inside and outside do not have to be subjected to the physical limits of space, nor does it have to be fixed in specific coordinates. For her, the house is not a limited and protected area. It is a place where inside and outside are established again in line with experience, memory and meaning. Therefore, the audience meets a permeable, liquid space concept where coordinates can change place depending on experience and context in "Hane," thus the opposite of the traditional perspective of space whose borders and coordinates have been predetermined. In this changing sense of space, inside and outside are experienced as areas that constantly leak into each other and whose meanings and coordinates are constantly changing according to their context. There is aesthetic arising from the coexistence of order and complexity in Ülker's exhibition. In the exhibition, the artist brings together two series derived from each other in an intellectual and sensory sense. She describes windows as insistent forms that open or close the space for viewing and determine the limits of view with their materials and shapes in the series "Pencere" ("Window"). The field of view is framed by the artist and each frame points to a certain point of view, a missing image. According to the movement and the angle of the audience, the image is constantly changing and flowing. The view place represents the audience while the window symbolizes the limited freedom and privacy that the audience has in their world in the exhibition; the artist refers to how the audience's perspective can change depending on cultural identity and personal memory. For Ülker, the window is the border drawn between the artists' being hidden, unknown and mysterious and other people. With the "Boğa" ("Bull") series in the exhibition, the artist draws the audience inside with bull figures that have an important meaning for her. She places this series among her other works with a mesmerizing structure. After attending the Vocational High School of Health Services and beginning work as a midwife in a private hospital, Nermin Ülker took the exams for a fine arts university. However, she did not go to attend the talent exam. She said was a person who did not listen to her inner voice but the people around her. Ülker said that she had every kind of hobby until the age of 35. "I was diving and rock climbing. After painting woods and glasses in my house, I met sculptor Fatma Savaş. She encouraged me to go to university saying that my design is really strong. I was a private nurse for a plastic surgeon back then. My life standards were high and I was established," she said. Then Ülker got into the Visual Arts Department at Işık University. She decided where she wanted to be. She first quit her job, then closed her house, transferred her belongings into storage and moved into a friend's house. While she was an experienced nurse for 17 years, she could not find a proper job for a long time. Then, she started to work night shifts at a private hospital with the salary of a newly-employed nurse. She implied, "I can say that the university led to a fundamental transformation in my life." Üker thinks that her first job as a midwife had a significant impact on her life in art. She highlighted, "I delivered my first baby at the age of 15 with the help of my teachers. I also experienced the death of the first anomaly baby at the age of 16. The feeling that with both of these instances terrified me. It taught me that I should do whatever I do with love. When I met sculpture, I passionately hugged it like holding on to life." She also said that she started to perceive life as birth and beyond when she was a midwife and discovered the mysterious and productive side of birth along with its pain and joy. For Ülker, the use of color, one of the most magical and key components of her productions, has numerous meanings inspired by cultural memory and a symbolist approach. She stated that her works have the power to carry the audience to a dream world with colors for a moment. She uses metal, mostly stainless steel and weathering steel in her work. "Iron, which is a cold material, turns into a warm material with color. Even if I use yellow, blue and orange colors in my works which I made with electrostatic and car paints, I also include them in my sculptures along with the symbols of geometric shapes. When you paint the iron, you cut off its relationship with the air. This means the death of the iron for some. You prevent rust with paint. Rust symbolizes life for iron. I have incorporated rusty works and time into my works," she stressed. Talking about her latest exhibition "Hane," Ülker said that she did not associate the word "hane" with house at first. She thinks that "hane" does not only contain the meaning of house itself but is a reference to individuals that live in it. It means the place of those that use the same common areas along with common ideas and concerns. "I grew up at a boarding school with homesickness and this missing feeling never disappeared. Everybody's description of a house is different. I have been using the top floor of my workshop in Maslak Oto Sanayi as my house for a long time. I recognized in these ages that my house is actually myself," she stated. Ülker gave more details about her exhibition's series. The starting point of the window metaphor, which is also the subject of her first two exhibitions, is Ülker's workplace with no windows such as delivery rooms and operating theaters. She noted that the window metaphor in these works meant freedom and privacy for her. "If you do not work inside these places, you need special permissions for entry. When my contact with them broke off after I quit, they became places where I could not easily enter. The places in "hane" symbolize places which can be observed from the outside but cannot be entered into. "The bull metaphor is a little bit different. While I was doing my master's of Art Theory and Criticism, I chose the bull which is the symbol of writing and death as my subject at the sculpture workshop. Then, I isolated the bull figure with my form language and bulls were integrated into my series, as well." You will surely find aesthetics arising from the coexistence of order and complexity in her exhibition along with the two themes shaped in line with her background in art and business life. Lastly, the artist also mentioned her future projects. She said that every project contains premises of the next ones in itself. Her "hane" exhibition arose from her "Window" exhibition, for example; thus "hane" will provide the starting point for other exhibitions she said.